Oriental Rug Services- Cleaning and Repair any Type of Rug! When specialty rugs (Persian, Oriental, Turkish, Silk) are damaged, A2Z Carpet Cleaning Services recommends taking action sooner rather than later. These rugs are valuable works of art,Oriental rugs, antiques, collectibles, and family heirlooms demand professional treatment. A2Z Carpet Cleaning Services is staffed with trained, certified, and experienced cleaning professionals. We have restored everything in the past from torn dog eaten fringes to high traffic areas and party mishaps. When cleaning specialty rugs, there is more on the line than a regular carpet. Persian, Oriental, Turkish, and silk rugs can have significant financial, personal, and historical value. We understand delicate fibers and dyes in specialty rugs are strong and vibrant. We realize the value of the rug and work our hardest to make sure the centerpiece to your room is clean and beautiful. Our treatment is proactive in preventing future wear and tear. By using high end cleaning products, we can protect your specialty carpet from color fading, discoloration, browning, and more. Our process makes sure to gently clean your specialty carpet without damaging it. Pre-wash Dusting– We begin the cleaning process by thoroughly dusting your rug. This ensures that your specialty floorpiece will be spotless after it dries. 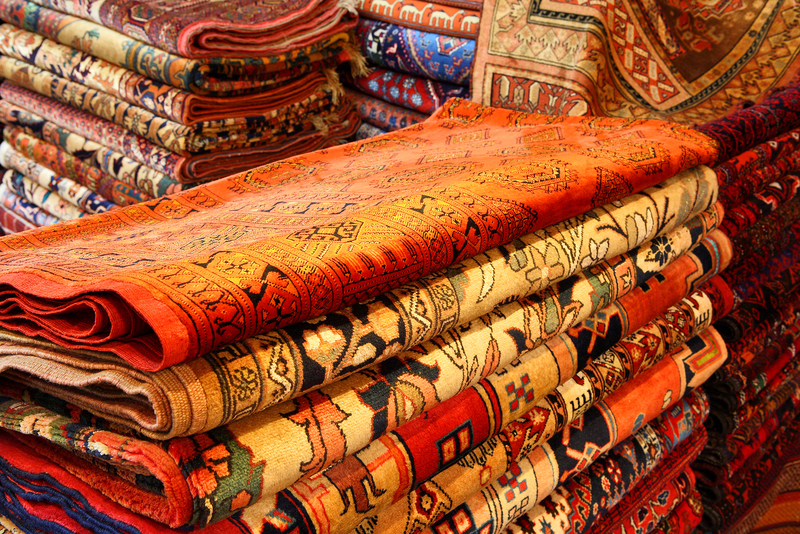 Dry Cleaning– Certain rugs require dry cleaning, where we use top of the line products to take care of your rug. Dry-cleaning utilizes non-polar solvents so that stains that would normally not dissolve in water, easily dissolve. This eliminates the needs for a high temperature and tumbling, resulting in less damage to delicate fabrics. Water Immersion– Some rugs can be cleaned through a thorough process of water immersion. We delve deep into the fabric, separating and removing any dirt and dust. We then apply a delicate drying process in a climate controlled room to avoid growth of mold or mildew. Moth proofing– When you have an exotic specialty rug, you must protect it from pests. Don’t let moths destroy a delicate rug that you love. Although vigorous and regular cleaning is the best way to keep moths away, we do have techniques to add an additional layer of protection to your rug. Fabric Protection – You want your rug to look clean and vibrant long after you bring it to our specialists. Our techniques in fabric protection will safeguard your rug from future deterioration. Pet Odor Treatment/Disinfecting– Although we love our pets, they can be a disaster when it comes to carpeting. Foul pet odors and germs can ruin your elegant specialty rug. Our disinfecting process uses top of the line cleaning products to give you an odor-free, clean rug despite your furry friends. Teflon Coating– Teflon protection is a great way to guarantee a long life for your exquisite oriental rug. When you spill something onto an unprotected carpet, you can expect stains and odors. Teflon protection works to repel dirt and prevent the carpet from absorbing spills. Rug Blocking– If your specialty rug is placed in an area with a good amount of foot traffic, there is a good chance it could get wrinkled and misshapen. We apply high-quality products to your floorpiece to soften the material. Next, we use our machines to smooth out the rug and reshape the fabric. We then carefully dry the carpet, leaving it looking brand new. 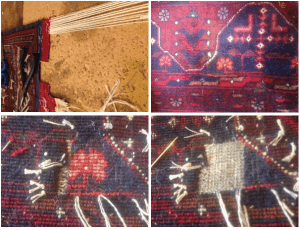 When we evaluate a rug before applying repairs, we carefully examine your rug and consult with you on which rug cleaning methods will be beneficial. 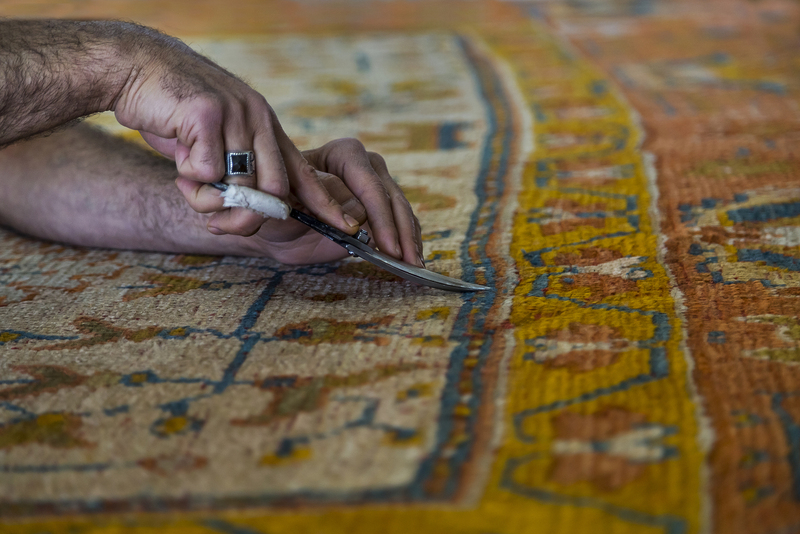 Our technicians specialize in the rug’s particular type of weaving. Only a repair specialist can do a professional repair on handmade rugs. There is no job too small or large. If you are looking for a professional & experienced Oriental Rug Cleaning Company serving all of New Jersey contact A2Z Carpet Cleaning Services.